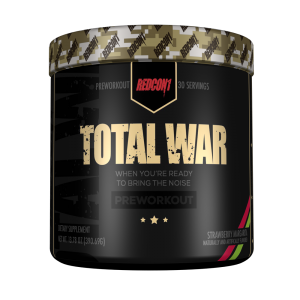 Suitable to be taken before a workout, Hot Blood 3.0 provides your body with all the stimulants required for a workout. 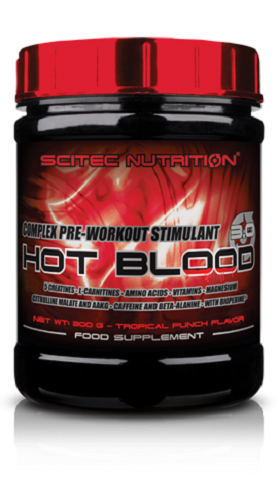 Containing a mix of creatine, caffeine and Amino acids, Hot Blood will let you take your body to the max. 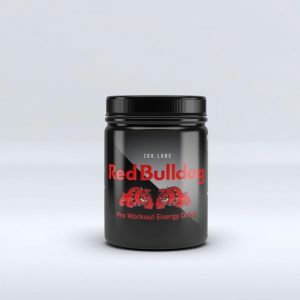 Perfect for people wanting to maximise the effect of a pre-workout, Hot Blood 3.0 is a careful balance of important ingredients which provides all the necessary additives required in any pre-workout. 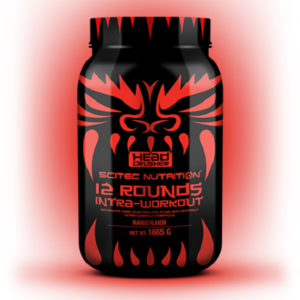 Available in a range of great flavours, Hot Blood is a true pre-workout experience. Guarana: Maltodextrin, Creatine Monohydrate, L-Arginine HCl, Dextrose, L-Arginine Alpha-Ketoglutarate 2:1, L-Tyrosine, Beta-Alanine, Acidity Regulator (Citric Acid Anhydrous), Flavor (Guarana), Caffeine Anhydrous, Acetyl-L-Carnitine HCl, Anti-Caking Agents (Tricalcium Phosphate, Colloidal Silicon Dioxide), Magnesium Carbonate, Camellia sinensis (Leaf) 8:1 extract, L-Citrulline DL-Malate 1:1, Taurine, Sweeteners (Acesulfame K, Sucralose), Colors (Carmoisine**, Ponceau 4R**), Creatine Citrate, Creatine Pyruvate, Kre-Alkalyn® (buffered Creatine Monohydrate), L-Carnitine L-Tartrate, L-Ornithine HCl, MicronTec Micronized Creatine Monohydrate, Sodium Hydrogen Carbonate, Nicotinamide, Vitis vinifera (Seed) 20:1 extract, Alpha Lipoic Acid, Piper (Fruit) 50:1 extract, D-Biotin, Pteroylmonoglutamic Acid. 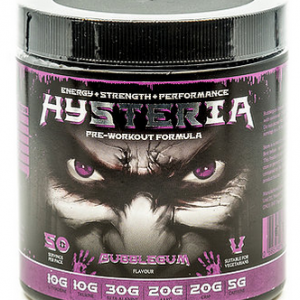 Pink lemonade: Maltodextrin, Creatine Monohydrate, L-Arginine HCl, Acidity Regulator (Citric Acid Anhydrous), L-Arginine Alpha-Ketoglutarate 2:1, Dextrose, L-Tyrosine, Flavor (Pink Lemonade), Beta Alanine, Caffeine Anhydrous, Anti-Caking Agents (Tricalcium Phosphate, Colloidal Silicon Dioxide), Acetyl-L-Carnitine HCl, Magnesium Carbonate, Camellia sinensis (Leaf) 8:1 extract, L-Citrulline DL-Malate 1:1, Taurine, Sweetener (Acesulfame K, Sucralose), Color (Beetroot Red), Creatine Citrate, Creatine Pyruvate, Kre-Alkalyn® (buffered Creatine Monohydrate), L-Carnitine L-Tartrate, L-Ornithine HCl, MicronTec Micronized Creatine Monohydrate, Sodium Hydrogen Carbonate, Nicotinamide, Vitis vinifera (Seed) 20:1 extract, Alpha Lipoic Acid, Piper (Fruit) 50:1 extract, D-Biotin, Pteroylmonoglutamic Acid. Tropical punch: Maltodextrin, Creatine Monohydrate, L-Arginine HCl, Dextrose, Acidity Regulator (Citric Acid Anhydrous), L-Arginine Alpha-Ketoglutarate 2:1, L-Tyrosine, Beta Alanine, Flavor (Punch), Caffeine Anhydrous, Acetyl-L-Carnitine HCl, Anti-Caking Agents (Tricalcium Phosphate, Colloidal Silicon Dioxide), Magnesium Carbonate, Camellia sinensis (Leaf) 8:1 extract, L-Citrulline DL-Malate 1:1, Taurine, Sweeteners (Acesulfame K, Sucralose), Colors (Carmoisine**, Ponceau 4R**), Creatine Citrate, Creatine Pyruvate, Kre-Alkalyn® (buffered Creatine Monohydrate), L-Carnitine L-Tartrate, L-Ornithine HCl, MicronTec Micronized Creatine Monohydrate, Sodium Hydrogen Carbonate, Nicotinamide, Vitis vinifera (Seed) 20:1 extract, Alpha Lipoic Acid, Piper (Fruit) 50:1 extract, D-Biotin, Pteroylmonoglutamic Acid. Mix 1 serving (20 g) with 400 ml of cold water daily. Slightly carbonated, open bottle lid when mixing every 5 seconds to avoid accidental pressure build-up! 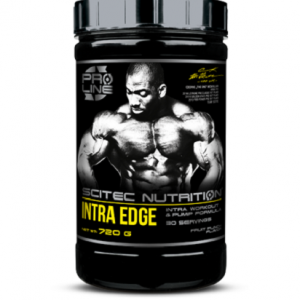 Use 30-45 minutes before training, preferably on an empty stomach. Individuals sensitive to stimulants should first assess tolerance by taking half servings (contains 300 mg of Caffeine per serving). Active gym users looking to increase the intensity of their workouts.